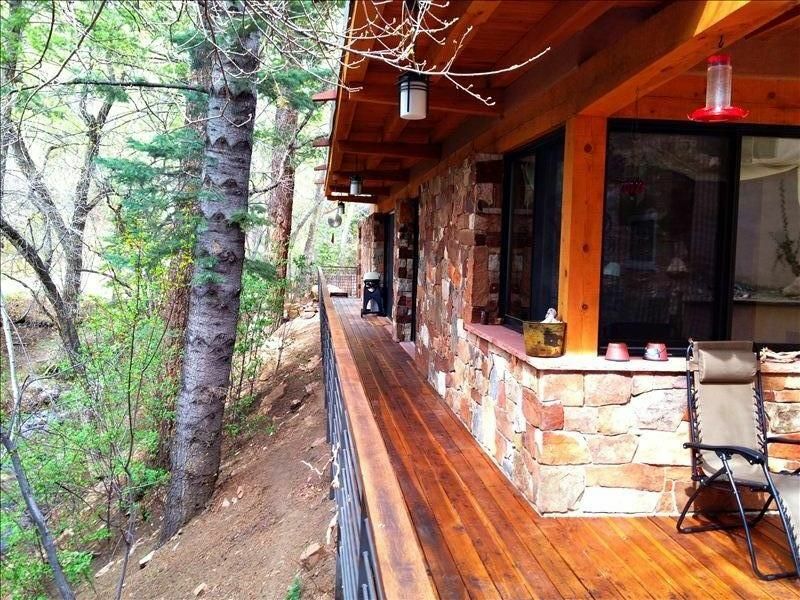 Beautiful modern mountain cabin with all high end amenities INSIDE the Santa Fe National forest. The home is all on one level - no stairs of any kind (except the exterior stairs down to the hutub) King bed in the master and two queen beds in the guest rooms - all plush pillow top beds with very comfy sheets and down comforters. Fully stocked kitchen with a Viking range and everything you will need. Extreme privacy - this is one of the only properties like this in the Santa Fe area - a true mountain paradise get away, yet so close to town with a mountain creek that winds through the forest. Out door enthusiasts will love it here, bring your mountain bikes in the summer and your cross country ski's in the winter, ski right out the front door! Since we are located in the national forest hikers will love it here. There are great trails within walking distance or by a short drive - another reason to have an SUV so its easier to get up into the forest past the cabin. The home has ample deck and patio space overlooking the creek and hot tub, perfect for out door entertaining. Birders will love it up here! We have great birds all year around but especially in the summer when the hummingbirds are everywhere. Cool temps in the summer when downtown is hot! Encantado resort is right down the road for world class dining and spa services. There is a 2 mile dirt road to the property and the last 1/2 mile can be very bumpy and it can get muddy or snowy depending on the weather. I would recommend an SUV or higher clearance vehicle for the summer months to make travel on the road more comfortable. In the winter a four wheel drive SUV or truck is mandatory because we are in the mountains and there will be snow - see the pictures. So if you are looking for a place to truly relax and be surrounded by nature yet be close to all that Santa Fe has to offer please consider us! Pets are allowed for a fee, please discuss with me first. My name is Brian and I have lived in this paradise for over 17 years and now its time to share. This is the only location thats this close to Santa Fe, inside the national forest, on a stream that affords total privacy and high quality of living. I feel so blessed to have been able to live up here all these years. I can never get over how beautiful Pacheco Canyon is! This home was designed by and award winning designer - no boring architecture here. The home was planned to feel like the outdoors and indoors were one, and I truly think we succeeded. Sitting by the creek, watching the humming birds, having margaritas on the deck - or in the hot tub. Mountain biking and skiing right out the front door - endless miles of hiking and exploring, watching the birds - it never gets old! The only problem with staying up here is that you will not want to leave....Santa whaa? The detached studio has a 3/4 bath. A land line is available for use. Cell phones normally don't work to well up here in the canyon. Radiant heat in the floors. Very nice Morsö wood stove with wood provided. We have Wi-Fi that is suitable normally for streaming movies but it is only 1.5 Mbs and can be slow especially if multiple devices are being used. The cabin and the studio both have nice wood stoves for a romantic fire. I have a traditional coffee maker and coffee grinder and also a Kureig coffee maker. I normally have olive oil, salt and pepper and various other spices, honey and plenty of condiments in the fridge. Cross country skiing in the winter right from the cabin if the conditions are right. Skis can be rented in town. Situated right next to the creek! I provide hiking books and maps of the area trails, nature guide books and water bottles are available if needed. We've also got sleds for the winter! We very much enjoyed the peace and quiet. The local critters and birds who look forward to their morning meals. The beautiful light Spring snow made our Sunday hike even more spectacular and refreshing. A perfect place to get away from noise, traffic and people and enjoy the beauty of nature and only the sound of birds and a roaring creek. The Hot Tub and Sauna Shower were icing on the cake. Loved the house! Beautiful location away from it all, yet a short drive to the plaza. The house is stocked with anything you could ever need. Of the numerous houses we have rented, this one is our favorite. Beautiful cabin with thoughtful detail. Loved every minute of it. This cabin is an absolute dream. It is close enough to town to enjoy dinner out but far enough away to enjoy the tranquility of the forest. Every morning we fed the birds and squirrels and every night we sat in the hot tub next to the creek. It has top notch amenities, it was generously stocked, and it has the most gracious property owner. You will not want to leave. I can't wait to book again. This beautiful cabin is a joy to experience. Fully equipped (except with a 4 wheel drive vehicle which you should provide), the cabin allows one to get away from it all but be close to a city for restocking. My advice: stock up on provisions before you go up the canyon road because once you're there, you'll never want to leave. In addition to the excellent cabin, linens, facilities, the stay was made even better by Brian's gracious hosting. Note: if you are addicted to Wi-Fi, you don't want to be up here during snowy weather. But if you're going to the cabin to enjoy the clean air, beautiful forest, and delightful animals -- and you like board games, reading, and just hanging out together, this is the place for you. Hiking, skiing, sledding, and vegetating are the attractions of this location. And don't forget the hot tub!